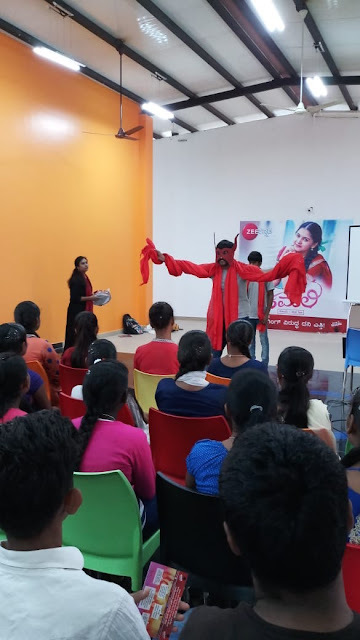 Bangalore, 6th June 2018: Zee Kannada, a leading general entertainment channel in Karnataka known for its diverse content and shows centred on inspiring characters, has launched a Karnataka-wide Anti-Ragging Campaign. With students from across the State moving to bigger cities in order to pursue their higher studies, the channel has taken up the responsibility to spread awareness against the ill-effects of ragging. Zee Kannada’s latest show, Kamali, will front the campaign, emphasising positive change among the student community in Karnataka. Kamali is the story of a young village girl's quest to excel in academics and become a Kabaddi professional, while fighting against all odds. Essayed by actor Amulya, Kamali embodies strength and determination despite several roadblocks, ragging being one of them when she moves to the big city to continue her passion for Kabaddi and studies. Ragging is an issue plaguing educational institutions throughout the country and through this campaign, Zee Kannada will reach out to students in a unique attempt to inform them on the harmful repercussions. By way of theatre and postcard distribution, the campaign was launched earlier today, starting with Bengaluru. The channel has visited four colleges in the city Surana College Peenya, Sri Lakshmi Group of Institution and Surana College Kengeri. This will be followed by in 25 colleges across different towns in Karnataka, including Tumkur, Hassan, Shimoga, Chikmagalur, and Hubli. In a novel approach aimed at connecting with the millennial student community, the programme in each college will feature a skit performed by a four-member troupe that showcased how ragging can negatively impact one’s life. Following the skit and games, Kamali-styled postcards will be handed over to the students, containing a helpline number for those affected by ragging. Featuring an anti-ragging message, these postcards will urge affected students to speak out and share their experiences. Zee Kannada's representatives will be on-location to address any grievances and direct them accordingly. Students will be encouraged to actively participate in the one-hour programme, flavoured with both performances and informational and determining content.